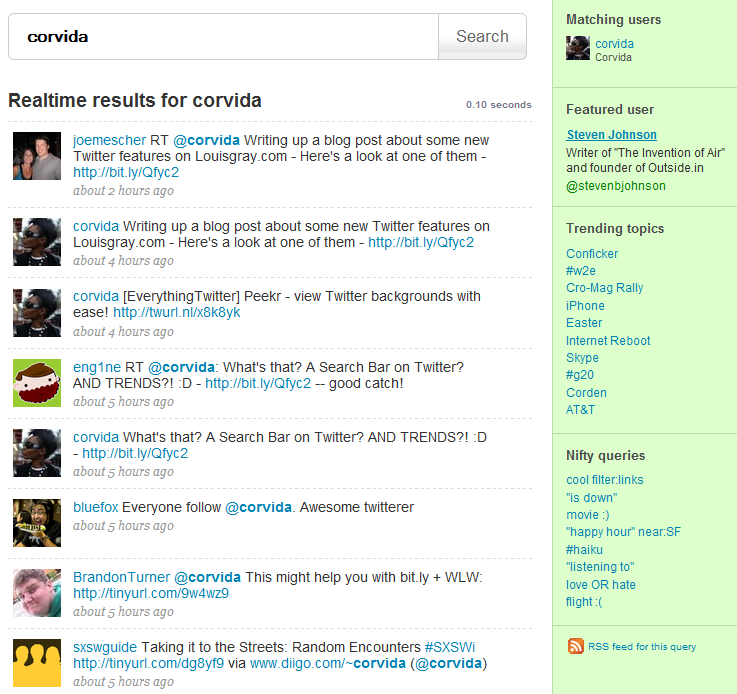 Have you noticed the recent changes to Twitter's web UI? For those that live in Twitter clients like Tweetie and Twhirl, you'll be in for a surprise if you head to the Twitter site these days. Twitter has come a long way since its popular debut at SXSW 07 in terms of performance. However, recently Twitter has started to up the ante on it's website and implement some of the most popular feature demands from the Twitter community. No @replies aren't a new feature. As of yesterday, Twitter is now doing something that should've been done last year: picking up on all @ replies. Previously, you would only see replies that featured @username towards the beginning of a tweet. Now, it doesn't matter where you put the @username. Twitter promises to still pick it up. The trends button only returned me to the homepage, so I have no idea what it will actually do. However, I have a sneaking suspicion that it will be a drop-down menu listing the latest trends linking to their search results. Looks like Twitter may finally start giving users a way to manage the mass onslaught of Twitter tools to use. We're constantly giving our password to so many Twitter apps and services that we forget that some of them still have access to our account. The connections tab seems like it will be designed to handle such problems. More To Come From Twitter? I'm sure there is, but for now these are some great recent changes to Twitter's website. It'll definitely enhance the Twitter experience, while potentially eliminating several addons and extensions in the process. Not everyone has these features available in their profiles. So one would assume that Twitter is testing some of these features on selected accounts. Don't be sad if you don't have some of them. They're probably right around the corner.